The car speaker was first introduced in the 1930s. And since its inception, the styles have evolved, as has the technology. There are multiple options now available and various specific features offered. It can easily become confusing to know where to start. Today, people use their car speakers for several usages other than just listening to music. GPS directions, podcasts, audio books and even phone calls may also use your car’s stereo system to provide sound. But where should you start looking for a new stereo? And how do you know when to replace your factory system? These questions are easily answered, but novice speaker shoppers will need to study first. Some of the terminologies will be useless unless you understand it. This guide was developed to help you understand every detail. It provides a basic education in vocabulary and strategy and is organized into 4 parts: types of speakers, speaker system sections, financing considerations and FAQs. Review the list to ensure you purchase the best speakers for your specific needs. This is measured in dB (decibels) and indicates the speaker’s loudness. Sensitivity is determined by the room or non-echoing environment. Some manufacturers give specifications on sensitivity being measured in an average room environment, while others consider an environment that is non-reverberant. Results of sensitivity measured in a room environment are inflated by approximately 2-3 dB over that of an environment that is non-echoing. The higher the rating of sensitivity, the louder the speaker. An average speaker has 87 dB to 88 dB sensitivity. A speaker with over 90 dB sensitivity rating is excellent. This is measured in Watts (W) and indicates the speaker’s ability to handle power with no damage caused. When a speaker is subjected to more power than mentioned, it will get damaged. Speakers have two power ratings – Peak and continuous or RMS. The RMS rating is the speaker’s continuous output without getting damaged while the Peak power rating is the speaker’s maximum power amount it can handle instantly. To compare different speaker powers, ensure that the power is indicated in RMS. 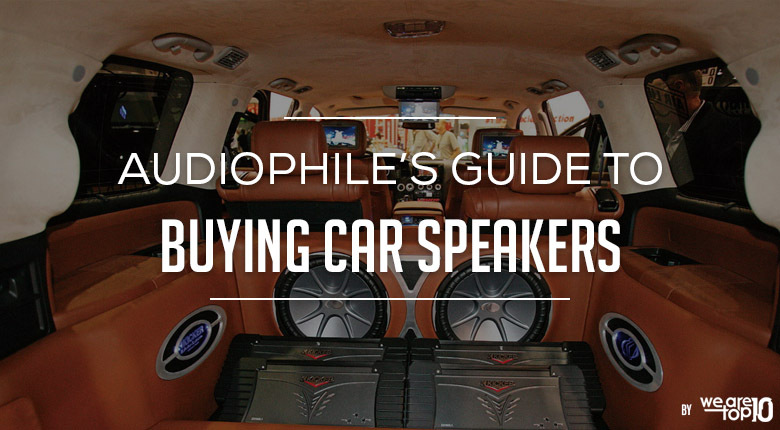 Before shopping for new speakers, get information on the ones you already have in your car. If you really need to replace them, then you can take out the old ones and measure them. Most stores are capable of giving you specifications for your car speakers based on the car model. Consider your financial situation and a reasonable amount to spend. New speakers can greatly enhance your driving experience, but do not have to cost an arm and a leg. There is a wide range of price options and something feasible for everyone. So determine your budget and stick to it. This will help weed out the impractical choices. When deciding what type of car speakers you want, and how much you are going to spend, also consider the extra features available. Think about if you require detachable tweeters (these can be installed in both component and coaxial systems and offer more mobility). Or, you might want pivoting tweeters (these are useful if you need to install in stubborn or tight spaces and also allow the passenger to rotate speakers toward their listening direction). Understand that no matter how much you invest, your speakers will not necessarily raise the value of your vehicle. They do not enhance the lifespan of your engine or add to any specific beneficial function, other than driver and passenger enjoyment. So don’t factor overall car value into any financial decision. The good news is that plenty of systems are easily removed and capable of being installed in new vehicles. Component speaker systems are exactly what they sound like. Separate components(tweeters, woofers, and subwoofers) that work together to produce a high-quality sound. These systems usually use crossovers connections (or cables) that create a clean separation between frequencies of the woofer and tweeter, thus allowing a crisper sound. Since the component speakers’ parts are separate, you are able to move the various sections around. You can create a unique and customizable listening experience. Component speakers produce a higher quality sound and provide even more enhancements than full range systems. Although pricier, these systems are built to last and made of high-quality materials. The component speakers are usually the more expensive choice (and can total almost $1,000). There are endless customization accessories and choices available, so be careful not to go over budget. These types of speakers are much more complex to install and require a higher level of expertise (be sure you trust whoever helps you complete the job). They are more complex to repair and again, may require additional costs. Coaxial car speaker systems are an all-in-one sort of model (the components are mostly within one unit). Thus, they are also referred to as “full range” systems. This variety of speaker was introduced in the 1970’s and has been popular ever since. Coaxial speakers still offer an assortment of choices and designs and are built to last. They are the less expensive option and are more affordable and appropriate for everyday use for drivers. There is something for everyone’s budget. The coaxial systems are super easy to install and offer a direct fit. If you want to install speakers on your own, coaxial or full range speakers are the way to go (and as always, check with professionals if you are unsure of the process). Still, offer an enhanced listening experience with a wider range of sound and is a great replacement for factory speaker systems. You cannot customize the coaxial speakers in the same way as with component speakers. There are fewer options for optimization and control. Although full range speakers provide a large scope of sound, you won’t note the specific bass tones, high tones or top-notch quality of the more expensive and powerful component speakers. Depending on the make and model of your vehicle, the all-in-one full range units may or may not fit in your car. They make various sizes and brands which have their different attributes, so you may have to shop around to discover the right one. These are the smaller speakers in a speaker system. They make high-end sound frequencies and are usually made of soft materials (like silk or other textile blends) that help produce soft sounds. The main benefit is that with tweeters, other speakers will not need to play the sound of the tweeter. A tweeter can be positioned to create a specific soundstage. By aiming a midrange and tweeter, in the right directions, you may get a soundstage that is accurate. Woofers are the speakers responsible for low to mid-range frequencies in a system. These speakers should be lightweight in order to project the correct sounds and are often made of materials like Polypropylene. Subwoofers are the speakers that produce the low sounds (normally below 180 hertz) in any car speaker system and are equally important as woofers and tweeters. The only way that you will get a rich, full and effective bass is by having woofers in your car speaker system. Adding a subwoofer too will give it that extra lift it has lacked as it will extend your bass sound system response greatly and improve your listening experience. These drivers deal with all frequencies below a tweeter and above a woofer or subwoofer. At this level of frequency, you will hear most musical notes. But these speakers will sound flat all by themselves. They will need the other components of the system to produce the correct tone and quality. Should I go for Component speakers for my car? With matched components that are properly powered, you will receive better imaging with more dynamic and detailed sound in comparison to conventional speakers. A tweeter mounted closer to the ear optimizes detail and imaging. You will need an external amplifier to boost your sound. Will new speakers even make a difference? Definitely!! Technology advancements have made it possible, so you no longer have to be a sound engineer or technician actually to hear the difference better speakers make. Factory systems will quickly wear out over time. Anyone will be able to notice the crisper sound and more balanced tone of newer speakers. They will positively enhance your overall driving experience. Will a tweeter make any difference? Tweeters made of paper are responsive as they are very light. Those made with silk or its polymers bend the sound in an even and smooth way. Dome tweeter has better off-axis imaging and dispersion compared to a cone tweeter. A dome balanced tweeter is a combination of the two designs where the dome is mounted inside a cone. What size speakers should I buy? It depends on what make, model and type of vehicle you drive. You need to make sure the new speaker system fits. The listed measurements of most speakers will specify the cone size. But this is not the only part to consider. You also need to pay attention to the depth and height of your car and speakers. Take measurements before you shop and avoid wasting time and money on a set that does not fit. Will my factory radio power aftermarket speakers? Yes. However, aftermarket speakers sound better with a little more power, but most car speaker’s sound fine with the factory power. The only exceptions are where matched sets of the component are used, as well as any speaker with 8 watts RMS minimum power rating or more. How do brands measure sound quality? This is one of the first things you want to identify when shopping for new car speakers. There are two distinct parts of measuring sound quality. First, note the frequency range. The wider a frequency range, the more sounds it can create. Second, recognize the sensitivity rating. This focuses on how much sound a speaker will create. Lower powered stereo systems need higher sensitivity rating and vice versa (a higher-powered system would need a lower sensitivity rating). Do I need to replace any wiring? Replacing wires is not always mentioned in installation conversations, but it should be. It is also not necessary. Factory installed wires work fine, but if you are purchasing an amp over 50 watts RMS, then you will want to replace the wiring. RMS is the rating used to measure power handling. The lower the power of the system, the less power they need to be able to handle. But of course, as with any product inquiries, always ask your local sales associates and technicians. Should I not be receiving better radio reception with my new speakers? It’s not always the case. What you are getting is a technology limitation of FM, rather than anything broken in your speakers. You may have noticed that the FM signals fluctuate between strong and weak as you drive. The signals are also affected by interfaces and more so in urban areas. There is no way that is currently available to boost your FM signals to CD sound quality.